Rare! 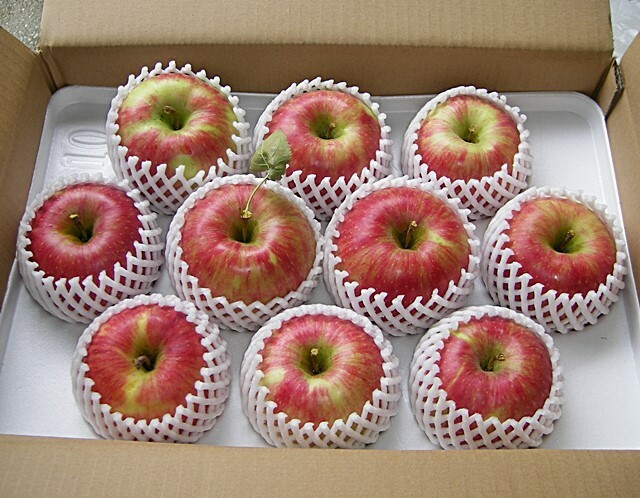 This is a box of precious "Kyushu's apples". 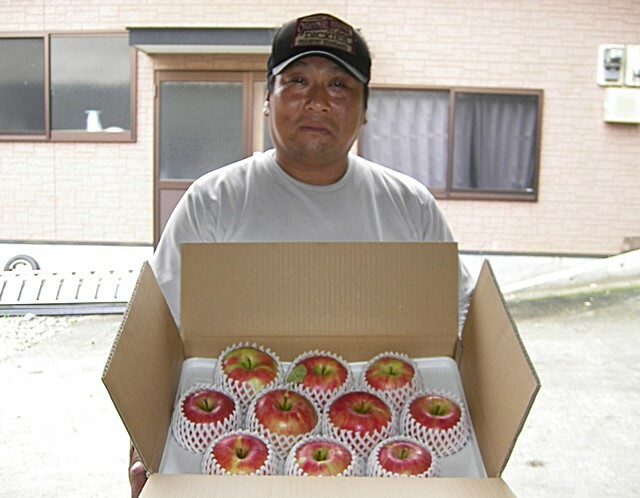 By the judgment of a producer (Miyashoji-Fruit-Trees-Association), they send you 5kg of apples among the best kinds in season. Please reckon as follows. 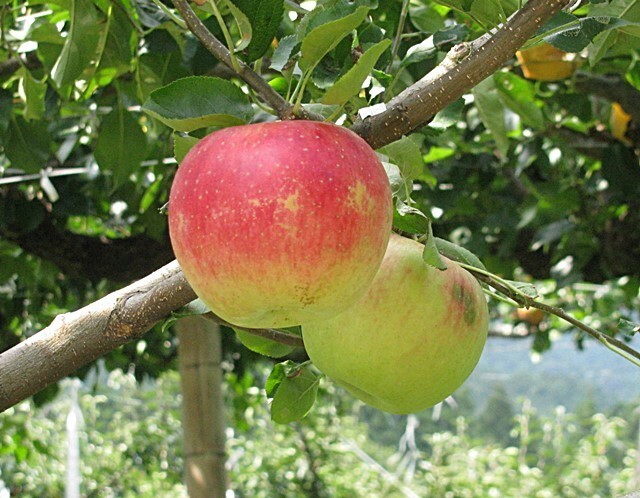 From the beggining of October to the mid-October is "YOKO", from mid-October to the latter half of October is "SHINANO-SWEET", from the end of October to the latter half of Nobember is "FUJI". 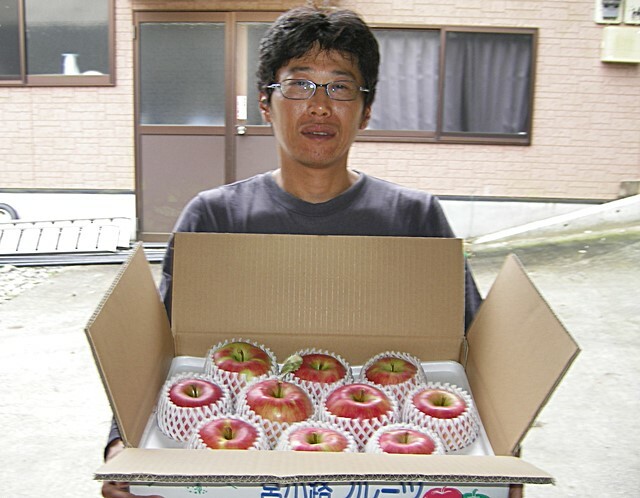 In a 4kg-Box, there are about 9 apples of YOKO, about 12 apples of SHINANO-SWEET, about 10 apples of FUJI. They will deliver you by RT-Service. 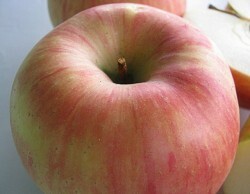 They have a good reputation about sweetness. 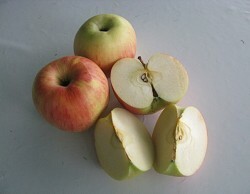 It is a characteristic of Kyushu's apple that it has little acidity and strong sweetness. 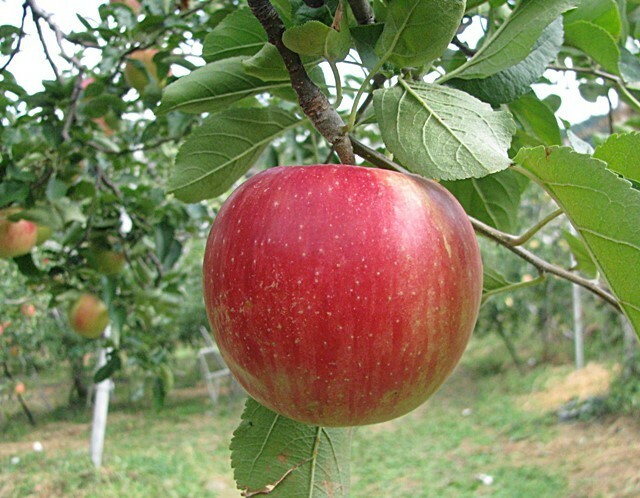 Besides, the apples become particularly sweet, because these apples are made in north side of mountain area in "Umami district" (the difference between the daytime heat and the morning coldness is intense) of South Fukuoka. 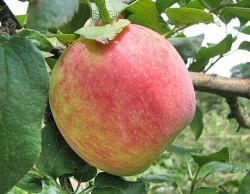 (The fruit has a property becoming sweet for self-defense so that heat and cold difference is large). This is bare ground cultivation. As for soil, that is red -soil which the manure effects longer (effect of the manure works slowly). 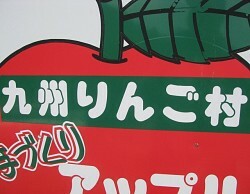 This is not a non-pesticides farming bu a reduced pesticides farming. But, they never use any weed-killesr. As for fertilizers, they use only organic manures (main ingredients are animal compost such as cow feces and the seedcakes). But the quantity is very little. They never give the additional fertilizers to them. As for watering, they trust rain basically. 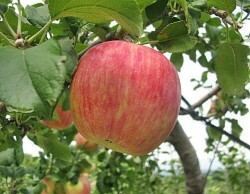 But in case of special situation, they use the upper-stream's water of Riv.Hei (a branch of Riv.Onga's upper-stream). It is a very clean limpid stream where a kind of trout "Yamame" inhabits. 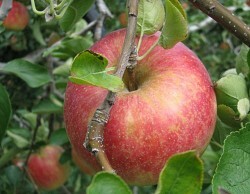 The location of the fruit tree shelf is perfect. It is in the north slope halfway up a mountain of highest peak "Mt.Mami" in mountainous district separating Chikuho plains and Chikushi plains. 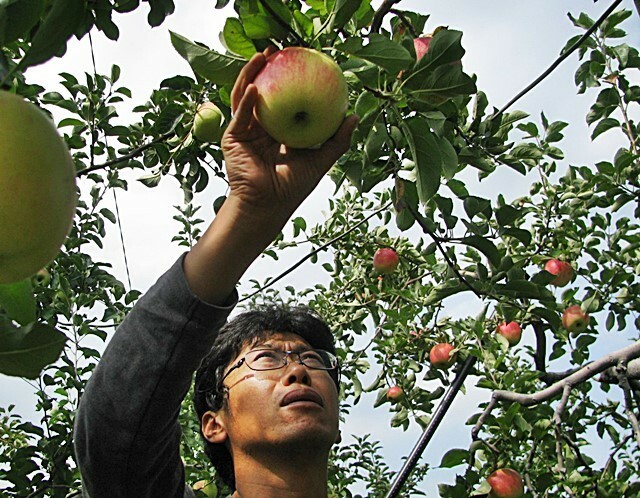 "A difference of heat and cold during a day" is large, and is along the limpid stream of Riv.Hei, and that is most suitable place for pomiculture. In addition, that place was a region where many people gathered from old days, because there was "Umami-Shrine" which protects Mt.Umami and the place used to be an area of the Mecca of SOMEN-NAGASHI. 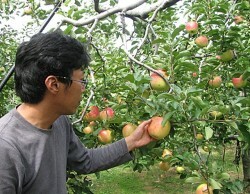 Then an idea to utilize this nature of this locality was born and an organization "Miyashoji-Fruit-Tree-Association" to run by an own effort without borrowing the power of the farm co-op started. It was in 1966. Nowadays, they become an organization of 6 farmhouses which unite strongly and is good friends though they are rival competitors each other. 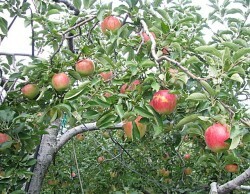 These are "apples in season" which are in good location like this and are cutivated by producers which walked on wonderful history. Please enjoy at any rate.